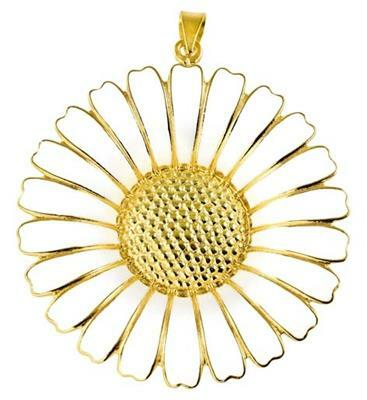 An eye catching and unique 43mm Daisy pendant in 22ct Gold plated Sterling Silver with the signature Lund polished white Enamel finish. This beautiful pendant from Lund looks fabulously fresh on a crisp Gold chain (available separately) and makes a real style statement for any season. We love the contrast between the bright white and deep yellow Gold, which has a very classic and fresh feel. The Lund collection of Daisies in Gold and White enamel feature earrings, pendants and bracelets and make a beautiful set.